Rosy Aronson, PhD, is an inspirational artist, author and spiritual counselor with a Masters in Expressive Arts Therapy and a Doctorate in Intuitive Listening & the Creative Arts. Her deepest intention is to provide empowering tools for people to awaken to their gifts and bloom into their authentic selves. 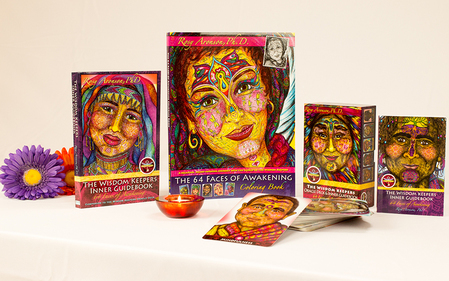 With this in mind, Rosy has created the 64 Faces of Awakening, The 64 Faces of Awakening Coloring Book, The 64 Faces Global Outreach Projects, The Wisdom Keepers Oracle Deck, The Wisdom Keepers Inner Guidebook and The Designed to Blossom Creative Self-Study Course in Human Design to reflect essential healing archetypes that lie at the foundation of our universe.